the location will be sent directly to your INBOX. 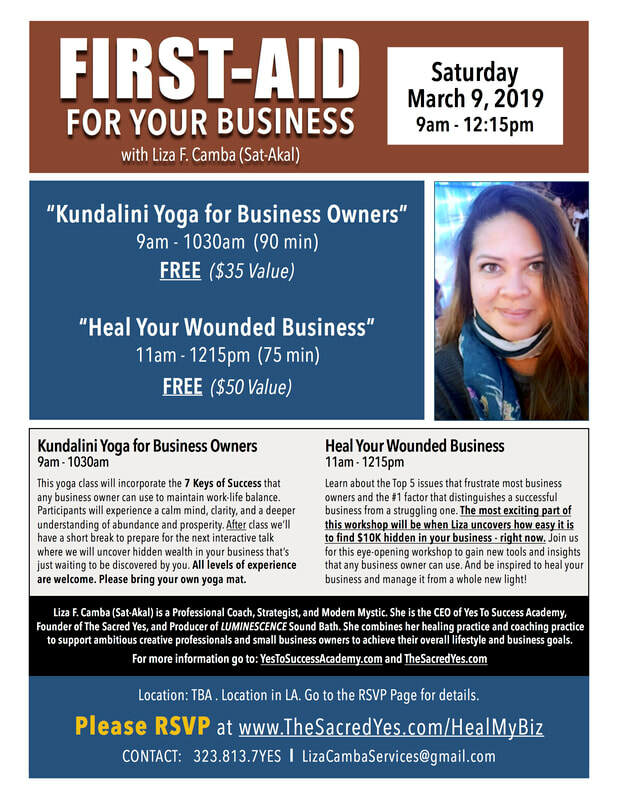 This workshop series is for you IF you are a small business owner who is struggling to keep your business afloat -and/or- you are a small business owner who is ready to take your business to the next level - being in service to more of your ideal clients and reaping the financial rewards of making a bigger difference in the lives of the people you serve. This yoga class will incorporate the 7 Keys of Success that any business owner can use to maintain work-life balance. Participants will experience a calm mind, clarity, and a deeper understanding of abundance and prosperity. After class we’ll have a short break to prepare for the next interactive talk where we will uncover hidden wealth in your business that’s just waiting to be discovered by you. All levels of experience are welcome. BRING: Please bring your own yoga mat and dress comfortably. Learn about the Top 5 issues that frustrate most business owners and the #1 factor that distinguishes a successful business from a struggling one. The most exciting part of this workshop will be when Liza uncovers how easy it is to find $10K hidden in your business - right now. Join us for this eye-opening workshop to gain new tools and insights that any business owner can use. And be inspired to heal your business and manage it from a whole new light! RSVP - Please Pre-Register for each workshop. centrally located in Los Angeles, between Hollywood and Pasadena. You will be informed about information relevant to this workshop. Also you will be added to Liza's newsletter, which you have the option to opt of as well.